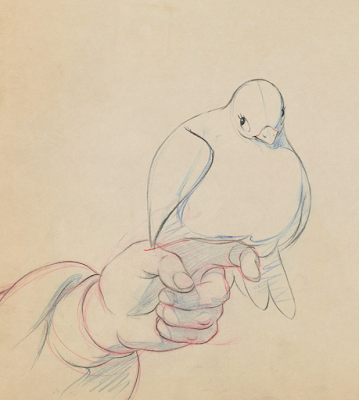 Milt Kahl was a junior animator in his 20s when he animated this scene with a dove "delivering" a kiss from Snow White to the Prince. I find this key drawing simply stunning. It shows that Milt was already a master of staging a situation (as well as a master of drawing hands). The bashful tilt of the dove's head is PERFECT! In the hands of a lesser artist, this moment could have been a B continuity scene, instead it turned out to be an A+. A lot of dedication and love in this drawing. It appears in my book on Disney's Nine Old Men. and are shown here for educational and inspirational purposes only. I spent 30 years at Disney. Right now I am focusing on my own animated short films, sculpting with wire and this Blog. I might be back at Disney some time.....who knows.